lively animated series, now available on DVD. has a special place in my heart as one of my very favorite novels that I remember reading and re-reading along with my brother and parents until we’d darn near worn out our old, beat-up, original blue-covered copy. Obviously we weren’t alone as — exactly thirty years after its original publication in 1978 — the latest edition of Sideways proclaims that, “more than 6 million kids have laughed at the wacky stories.” And fittingly, marking its thirtieth anniversary, the first season of the Nickelodeon and Teletoon coproduction, an animated television spin-off Wayside School, has been released on DVD complete with the original book that started it all. Having the unique distinction, as Wikipedia reports, of being the “only series to be both a Teletoon Original [Canada] and Nicktoon [America],” the book was developed into a series by its director Riccardo Durante and its story editor and writer John Derevlany. Just in time for back-to-school, this two disc set from Paramount Home Entertainment serves up all thirteen episodes [roughly 293 minutes worth] to an adoring public of Sachar fans young and old, which seems quite fitting for an author who always stated that, “I write the books and let the market find who reads it.” Beautifully transferred to DVD with its original full frame ratio intact and close captioned on capable televisions for the hearing impaired, the series follows the original one hour animated television film released on DVD one year ago under the title Wayside: The Movie, which featured the voice of Juno and Arrested Development star Michael Cera as Todd, a new student at Wayside who quickly realizes that all is not what it seems at the school. For starters, instead of a thirty room building, Sachar’s fictitious Leaning Tower of Pisa-like setting was built thirty stories tall instead, as you can see in this clip below as Todd meets Louis the Yard Teacher (Sachar’s semi-autobiographical version of himself). Although he states the he “draws very little from personal experience,” admittedly some the students in the book “were named after children” Sachar had worked with when he worked at an elementary school in exchange for college credits at UC Berkeley. Yet, the most important development of this work for economics and law school graduate Sachar was that he found his calling in life, stating that while he “became the Noontime Supervisor, or ‘Louis the Yard Teacher’ as I was known to the kids," it became his "favorite college class, and a life changing experience." Not only was the character of Louis the Yard Teacher born but following his first graduation in 1976, it helped pave the way for his own brand of writing for children which he considers no different than writing for adults as he says he puts “the same care and effort into them as I would if I were writing for adults." And while admittedly for those unfamiliar with the book, the original movie would be beneficial as a valuable companion piece to establish the characters and wacky world of Wayside, the series quickly brings us up to speed with not only Todd and Louis the Yard Teacher, but also the rest of the occupants of Wayside School, especially in Todd’s classroom in the very highest level, on the thirtieth floor. Questionably in charge of molding young minds with, as we later discover, a circus background and no verifiable credentials, Todd’s well-intentioned but dim-witted teacher Mrs. Jewls offers the students she sometimes calls “monkeys” her own brand of wisdom including her belief that Wolfman and T-Rex formed Ancient Greece. And with strange rules such as deciding that all oral reports should be delivered to the class silently via charades, it’s no wonder that Todd is ridiculously placed on her discipline list each and every day, frequently forced to suffer the humiliation of leaving early to ride home on the kindergarten bus. As is often the case, two Type A students do not mesh well together so it’s unsurprising that Dana’s best friend is the clueless, self-absorbed, crying-fit prone Myron. While Dana constantly wants to put an end to fun, Myron’s slogan in life is “Vote for Me!” whether an election for class president is going on or not, erroneously believing he is Mrs. Jewls' most popular student. Although when he finally gets his chance to rule the roost, his ego shines through, and later Todd is quick to remind him that class president isn’t all it’s cracked up to be as it would prompt him to face his irrational fear of turning on and off the light switch which is the job’s only assigned duty. Rounding out the rest of the cast is the unforgettable, aggressively flirtatious, stalker-on-skates Maurecia. Having proclaimed an undying love for Todd, it’s become Maurecia’s mission to punch him at every chance that presents itself to show him (in her own adolescent way) just how much she cares. And while some of the other characters from the book series do make appearances like The Three Erics, the compulsively Halloween costume clad Stephen, the nearly narcoleptic Shari, John who is always upside down, and others, it’s some of the adults like Louis who never fail to entertain. Equally eccentric is the school’s mysterious cook Miss Mush who runs not only the cafeteria but also the honors class along with her sidekick Sammy, a dead rat who at one point is stuck in her ear for a majority of the show. Preferring to whip up items like a “crunchy couch smoothie,” “basketball juice,” and “doorknob juice” as opposed to most schools' overreliance on hot ham and cheese, corndogs and tator tots, her recipe du jour is the insanely potent Mushroom Surprise (which you can witness below). And while I must admit, I was a tad jealous when I first began viewing that I didn’t have the series when I was a child discovering Sachar’s work, at the same time I’m glad I only had the books and my imagination to get lost in. Yet, as a series, Wayside is of such remarkable quality that it also does the impossible in making us want to pick up the books when the credits roll, which made me tremendously glad the set included the original book as my old battered copy had been done in two decades ago. Additionally, it’s different enough that it leaves enough surprises for the reader to appreciate in the text as well as made the film critic in me wonder if — like Sachar’s award winning Holes — Wayside will be developed into a live action feature film someday a la Danny DeVito’s Roald Dahl adaptation Matilda, the Harry Potter series, or Tim Burton’s take on Dahl’s Charlie and the Chocolate Factory. 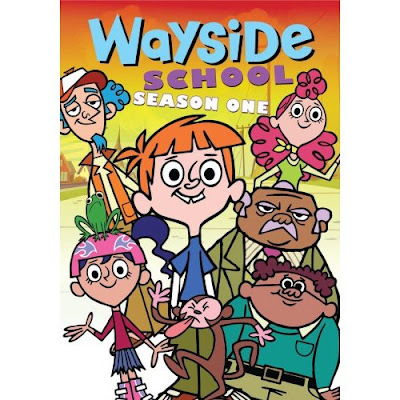 The episodes of Wayside School (now in its second season) are divided into two parts so that technically the DVD set’s thirteen episodes tell twenty-six memorably zany tales. And even though a few are less than effective, Durante’s vision and determination to engage young audiences (especially those with short attention spans) to Sachar’s world shines through in this upbeat, worthwhile series that succeeds where most fail. And that is, via strange supernatural plots and overly broad situations and characters, Wayside makes kids infinitely glad that — while they get to mentally attend for just thirty entertaining minutes — their own school seems far less intimidating than they’d initially believed. Therefore, although it’s delivered as sugar, the medicine that goes down in every episode is that, with the right attitude and imagination, school can be amazingly cool and doubly so when you can run home from the kindergarten bus to watch Todd's Wayside gang for thirty minutes.